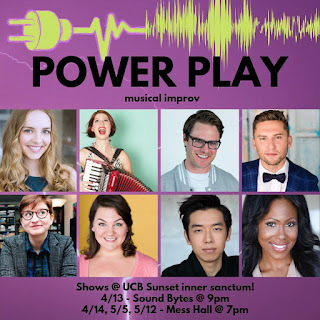 I'm thrilled to officially announce I'm part of the UCB Musical House team, Power Play. We perform every other Sunday at 7pm at UCB Sunset in the Inner Sanctum. Our team is made up of some incredibly talented individuals, and we are gonna make some amazing things happen. Our UCB debut is tonight!